Other than wind, we’ve had a remarkably warm December until the last few days of the year. 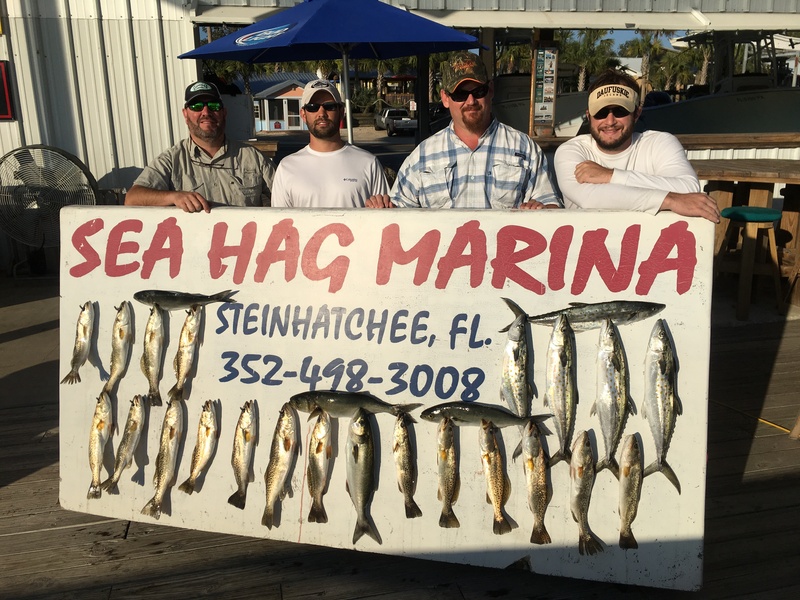 This has paid off; Steinhatchee is known for trout fishing, and this year has not disappointed. 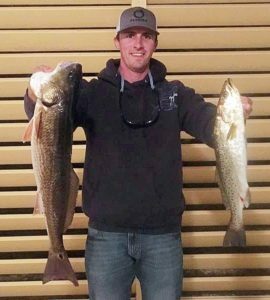 Winter is big trout time and some anglers have had a problem catching enough trout under the 20 inch limit (you can only keep one per person over 20 inches). People have been begging for a winter-time tournament, and this year was the First Annual Eggnog Open, with the grand winner catching the most weight of one redfish and two trout. 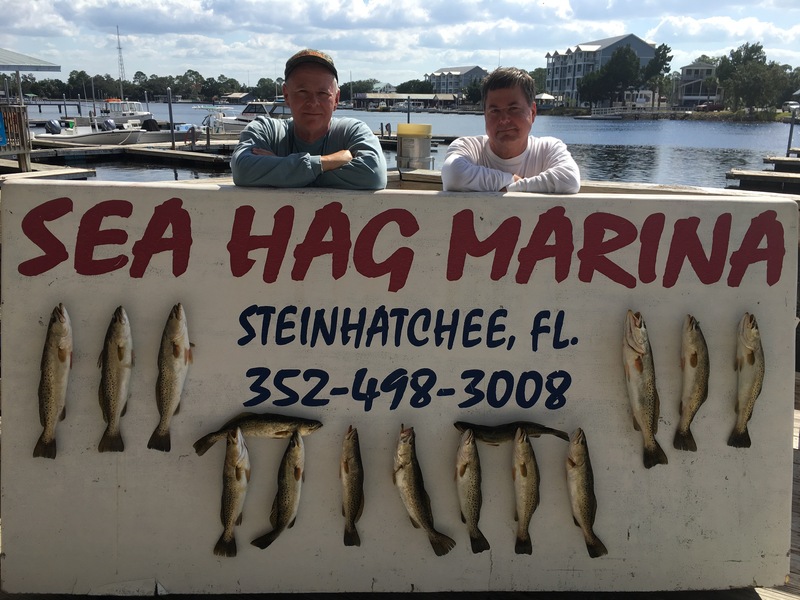 The winning team, Martin Simmons and Scott O’Brien from Jacksonville, a little under 15 pounds for the three fish. A number of 25 inchers were brought in. 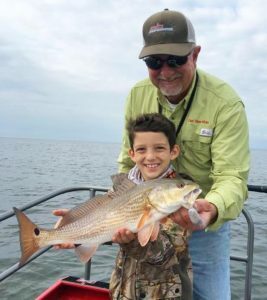 And with the warmer temperatures than usual, the redfish bite remained good, with non-stop action when schools could be located, and lots of upper- and over-slot fish still in the shallows. Offshore there was a good gag grouper bite but not many wandered out in the windy conditions. 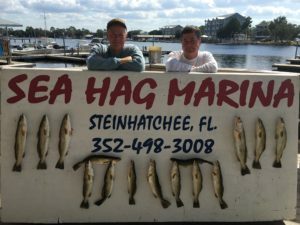 Here are some pictures taken around the Sea Hag this month. 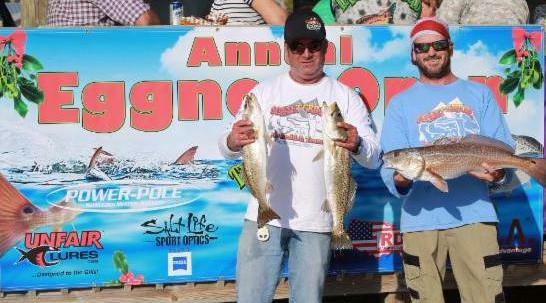 The winning team in the Eggnog Open…14.64 pounds. 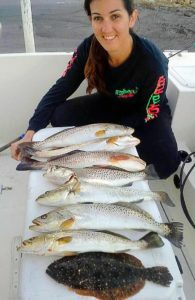 Fishing the Eggnog Open, youngest Sea Hag Chaeli Norwood with Maddy Fletcher scored on these fine trout. Curtis Cribbs made his presence known to this over-slot redfish. Dillon Swager with a fine matching pair…an upper-slot red and a gator trout. 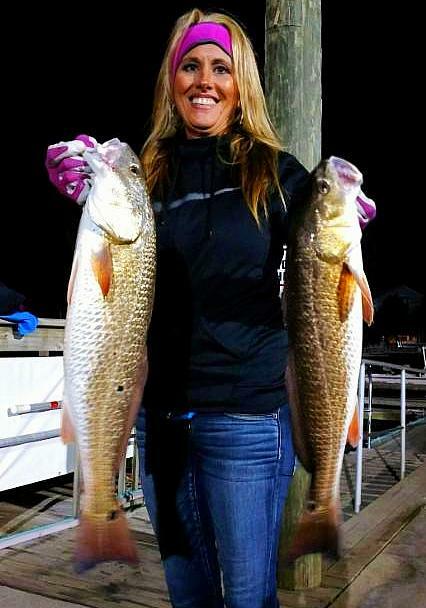 Claudia Sauls and her partner found these fine redfish and took them home for dinner. 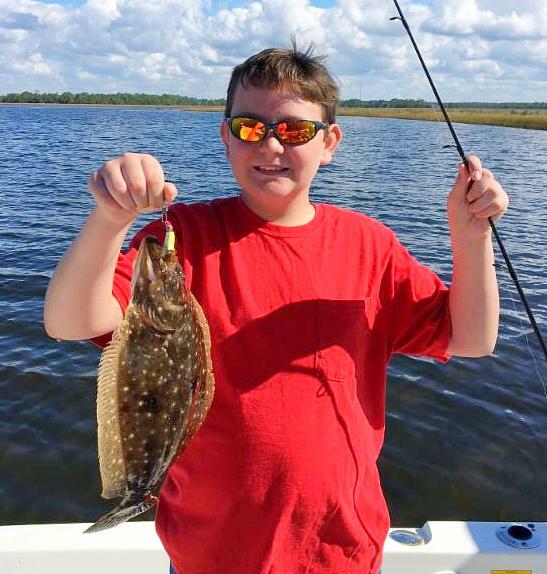 Alex Owens found a flounder. George Jones from New Hampshire decided to just fish right off the Sea Hag Marina dock and found this wandering redfish. 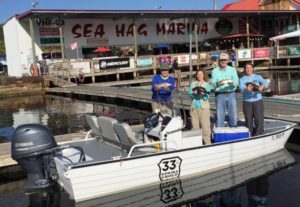 Ed and Marcia Ellett took their friends out on their new boat, won in the statewide STAR tournament, cobia category. Greyson Pyle from Trenton was excited by his trout. Lane Butler caught this redfish fishing with his dad Steve. Capt. 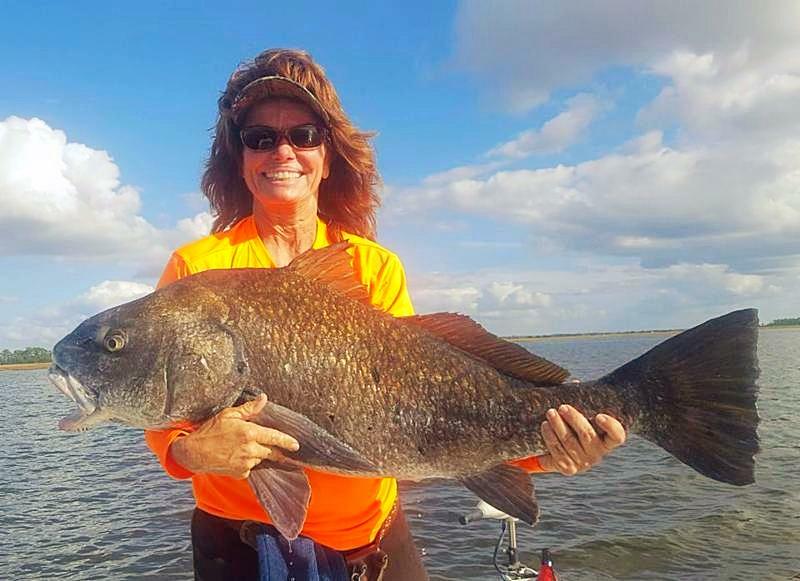 Leiza Fitzgerald, Florida CCA STAR Tournament director, found this giant black drum at Pepperfish Keys. 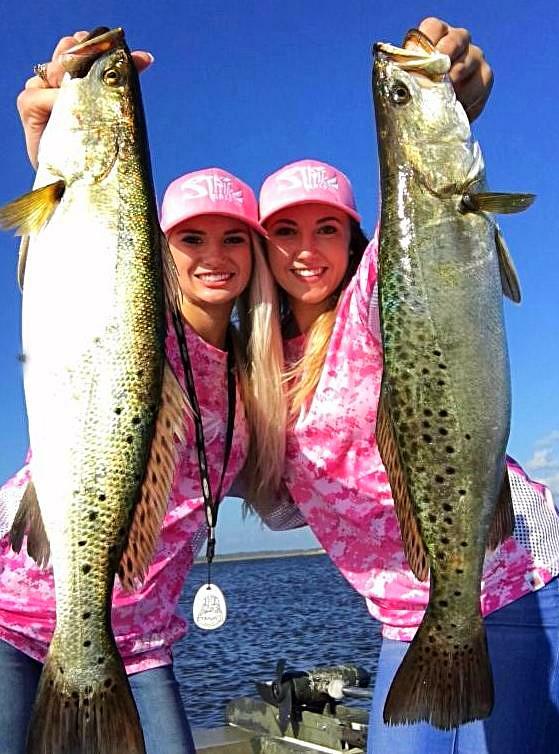 Kelby Sanchez with a beautiful pair of gator trout. 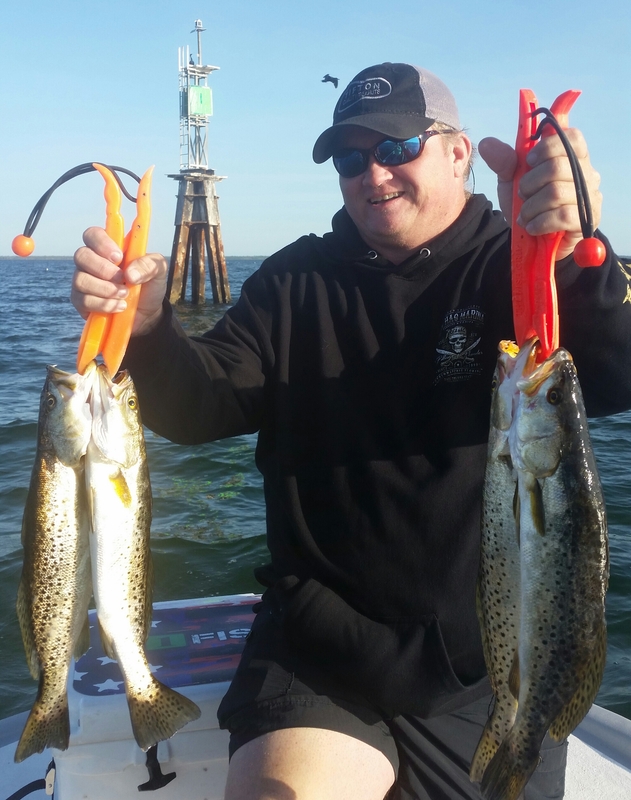 Robin Phillips with a bunch of nice trout and a flounder. 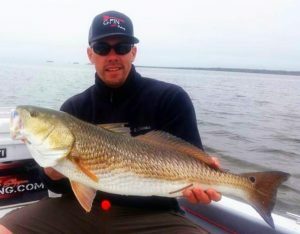 Brett Bond from Williston with an upper-slot redfish. 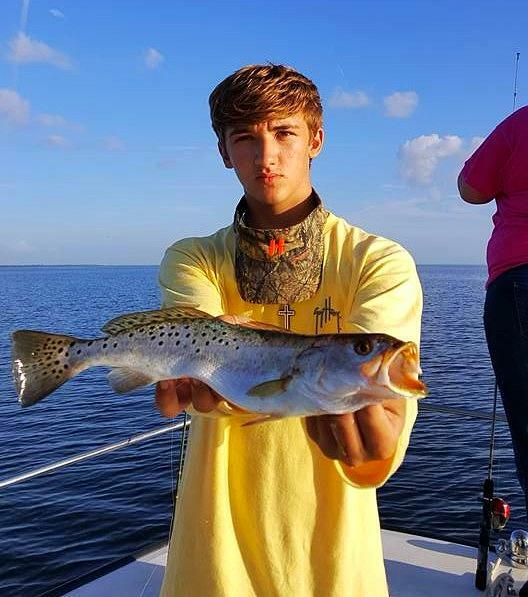 Hunter Barnhouse with a nice gator trout. 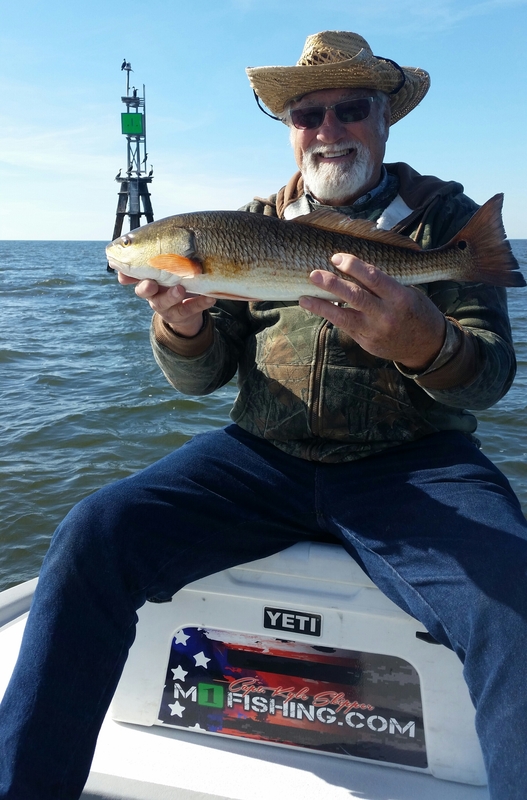 Steve Bradford found this red even on a colder day. January is the time when trout minds start thinking about deep water. As the cold fronts come through, and the flats begin to chill, warmer water is found at greater depths. 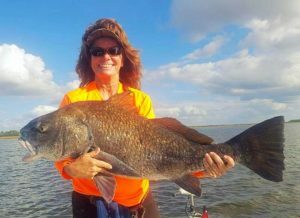 The deepest water less than ten miles or so offshore is the Steinhatchee River and some of the deep cuts in the flats and creeks. 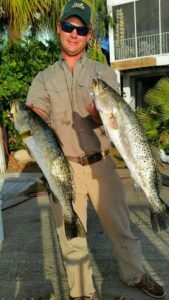 Unless the warming trend continues, at some point we will get temperatures in the 30s and 40s and trout will begin to move into and out of the river. 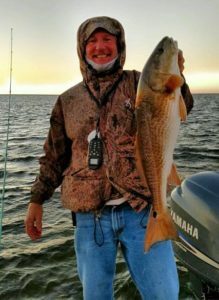 With extended low temps the trout may move way upriver, but most people will be found fishing between the Manatee Slow Speed zone and the river mouth, although always take a look at the Suicide Hole just west of the Sea Hag, and way upriver at what’s known as the Croaker Hole, where the powerlines cross the river. Here are a few hints for fishing the river. 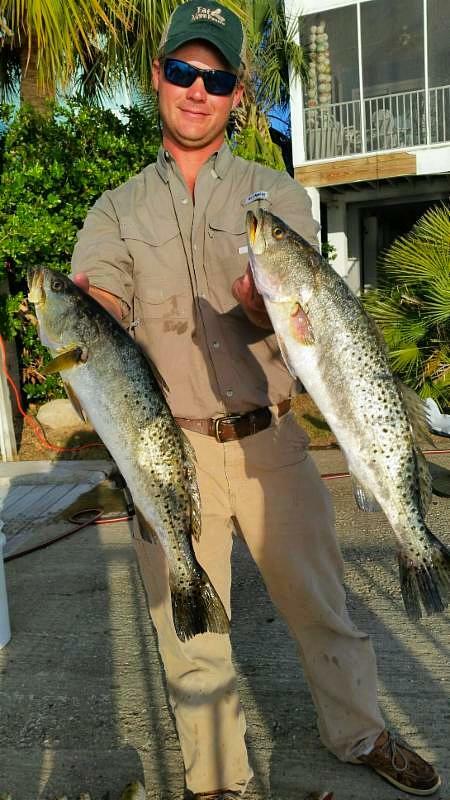 Trout move in and out of the river so the bite will wax and wane. Because on very cold days or in the mornings the temperatures are lower, they will stay in the deepest part of the channel, which is a problem, since that’s where the boats go. Everyone pretty much understands the rules of the road in the winter, but spend some time getting carefully anchored so you don’t drift into the channel. Most larger boats slow down when it gets crowded but not all, so beware of large wakes. Use your fishfinder to find schools of trout (they will be deeper; schools of mullet tend to be higher in the water column), but remember that not seeing them just means they’re not passing through at that time. Anchoring on either side of the channel between Markers 24 and the river mouth and casting upcurrent is the usual way to fish; however, some old-timers like to slow-troll Mirrolures until they find fish. 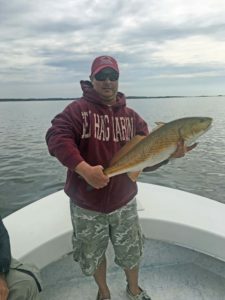 Other options are live shrimp fished with split shot or on a jig-head, Gulp shrimp baits on jigheads, or larger suspending plugs like the Mirrolures or Paul Brown lures. There may be a lot of boats around; be courteous, give people room. Remember that most of the time the fish are moving around. 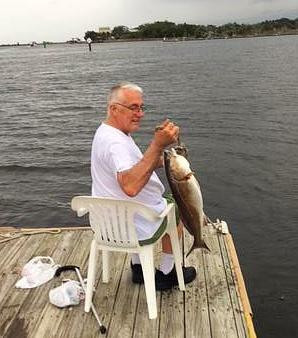 And here’s a hint for the rapidly warming afternoons with a higher tide: the mud bottoms along the shorelines will draw the fish out of the channel and onto mud bars, especially just west of the Manatee Zone sign, and on the south side of Marker 26, but take care in that area because of oyster bars. 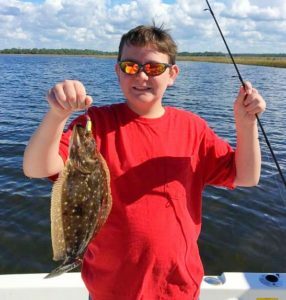 In those shallow areas, you can use popping corks and Gulp baits or live shrimp, but make sure you fish slow whatever you fish with; energy levels are low in very cold water. 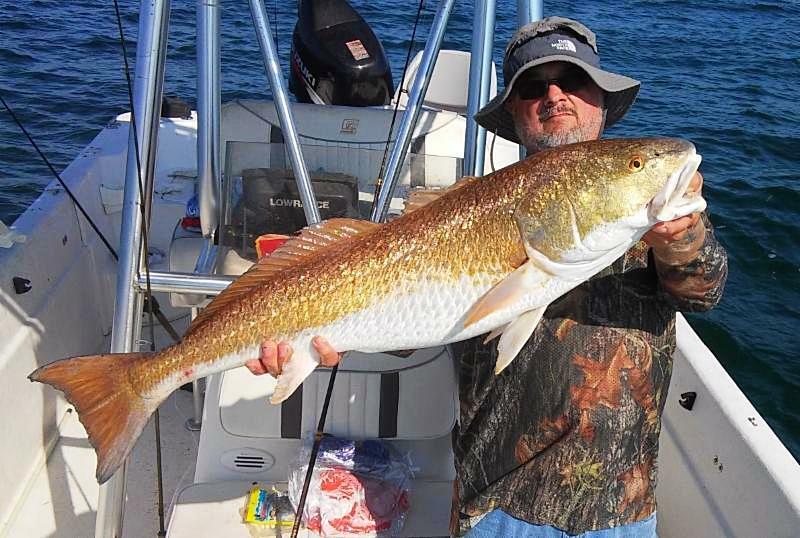 And at some point, with small boats and kayaks and enough water, I can guarantee there will be fish in Dallus Creek near the mouth in the two deep holes. Unfortunately, with really cold temperatures the redfish become pretty lethargic and difficult to entice, and for offshore, gag grouper season ends at the end of December. 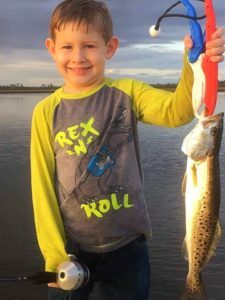 When the trout come in the river, it’s a great time for family fishing; don’t have to run too far, lots of fish available for non-stop action, and warm coffee is not far away. You can always call the Ship’s Store at the Marina to get an up-to-date report on trout fishing in the river. And consider coming for a long weekend and staying in one of our newly updated cottages. It’s peaceful and a good time to explore without crowds. 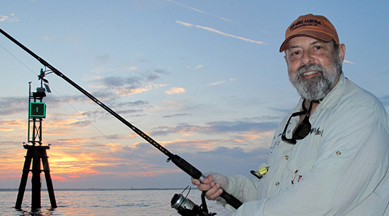 Here’s wishing all of you the happiest of New Year’s…and hope to see you on the water. 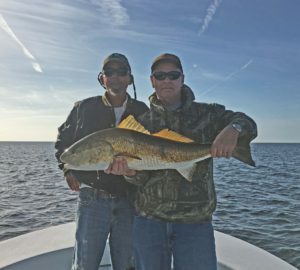 Sure was a warm December. Hard to believe fish were still on the flats. Some have started to move into the holes and rivers but it will take some colder weather to get them into the main river in large numbers. Redfish are around rocky areas in the shallows. Got some days open. 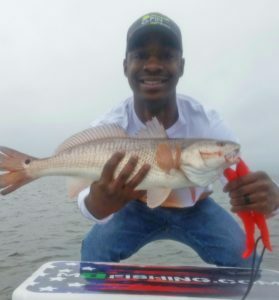 If you want to fish the flats call me, and check out my website for more information.